Sultan Kosen and Jyoti Amge met for the first time and posed for photos despite their almost 6-foot height difference. Hurriyet Daily NewsSultan Kosen and Jyoti Amge pose seem entirely unimpressed by their 6-foot height difference. 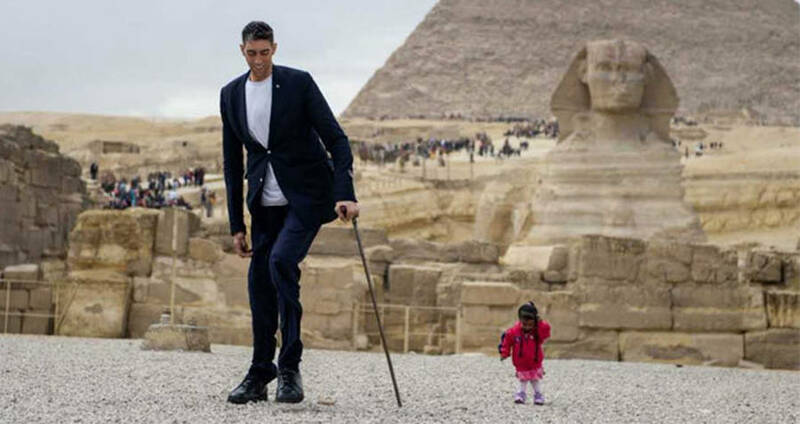 The world’s tallest man and the world’s shortest woman posed for a photo-op on Saturday, against the backdrop of the Great Sphinx of Giza. The tallest man on earth Sultan Kösen, an 8-foot-3-inch-tall farmer, towered over the diminutive Jyoti Amge, an actress from India, who measures just 2 feet. The pair were introduced as part of an event put on by the Egyptian Culture Ministry, in an effort to increase and support tourism to Egypt. The duo struck poses for awestruck tourists, clearly nonplussed by the roughly 6-foot height difference between them. Kosen, who works as a farmer in Mardin, Turkey, has held the Guinness World Record for the tallest living male since 2009. He also holds the record for the world’s largest hands and the world’s second largest feet. In 2011, he was remeasured and broke his own record for largest hands. His tiny counterpart, Amge, has held her own Guinness World Record for the smallest living woman since 2011 when she was measured on her 18th birthday. Amge has used her height to her advantage in her work as an actress, most notably being cast in American Horror Story: Freak Show as a member of a traveling freak show where she played a version of herself. Though this is the first time that Kosen and Amge have met, it isn’t the first time that Kosen has encountered one of his opposite record holders. In 2014, he was introduced to the shortest living male, Chandra Dangi, at an event in London. Amge has also been introduced to her male counterpart, though this is the first time she’s met someone as tall as Kosen. 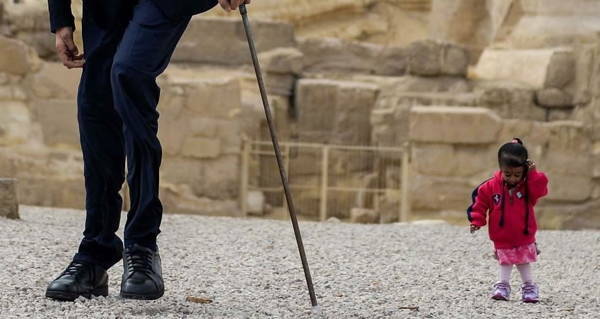 While the unlikely duo are in Egypt, they plan to visit historical areas and tourist sites, to hopefully encourage others to visit the country. The pair will also hold a press conference upon the completion of their journey. Next, check out the world’s tallest teenager and his 3-D printed shoes. Then, check out the world’s tallest treehouse. Finally, discover the stories of some of the most well-known sideshow performers of decades past.